Easter Sunday last year temperatures were in the low 70's. This year we'll be lucky if temperature break 40 degrees Sunday afternoon. Incoming high pressure Saturday night will allow skies to clear while bringing down an extremely cold air mass - for late March. 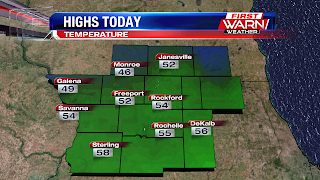 Temperatures quickly fell from the low 50s early Saturday afternoon down into the low 30s Saturday evening. 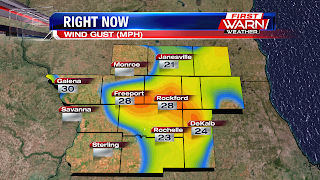 The gusty winds from earlier in the day will subside some as overnight lows fall on either side of 20 degrees. 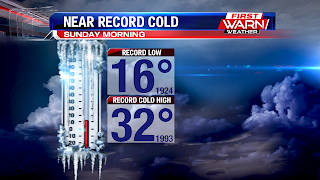 I'm currently forecast the temperature by Sunday morning to fall to 19 degrees, just three degrees shy of the record low for that day - April 1st. 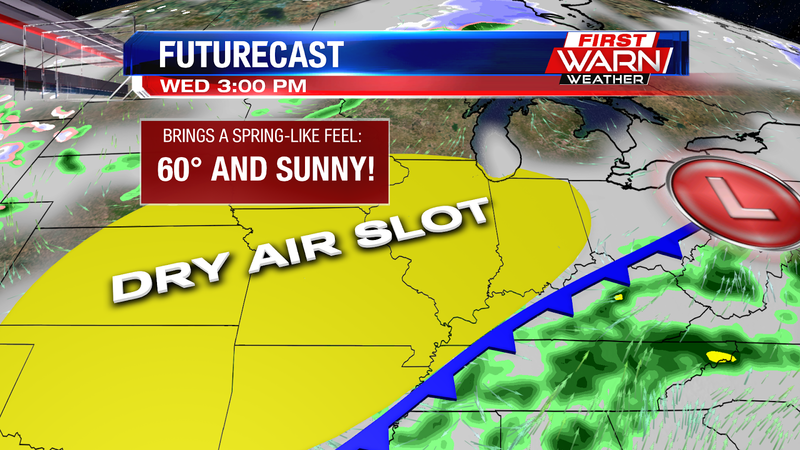 Highs will warm into the mid and upper 30's, nearly 20 degrees below average! The coldest high temperature ever record on April 1st was 32 degrees set back in 1993. We should warm above 32 degrees, but not but by much. Stay warm and have a wonderful Easter! The wind was sure whipping around Saturday morning and afternoon. 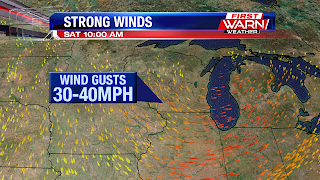 Peak wind gusts reached 45 mph in some spots throughout northern Illinois and southern Wisconsin, and even caused some damage up around Milwaukee. 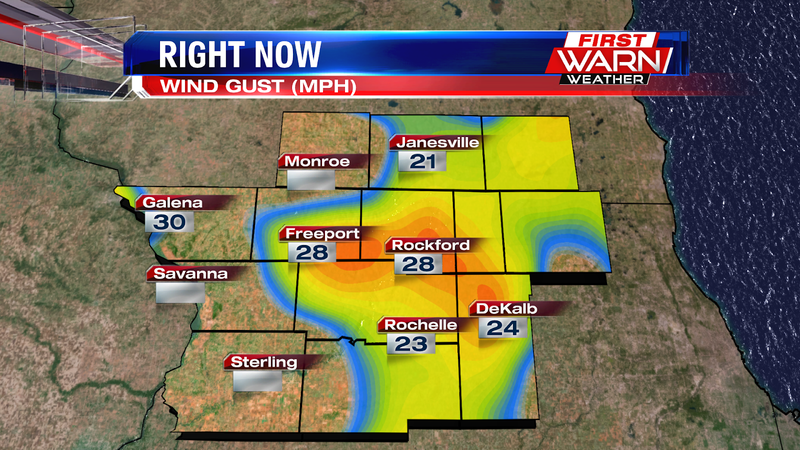 Current wind gusts are still close to 30 mph Saturday evening, but will slowly begin to subside through the overnight. We don't completely lose the wind at night, though, with winds still ranging between 10-15 mph. Highs Saturday did reach the low 50's in many locations, but have quickly cooled into the upper 30's and low 40's now that the cooler air mass has moved in. 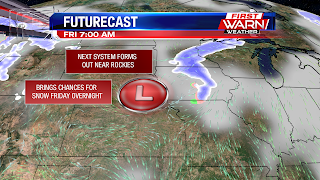 Overnight lows are expected to fall into the low 20's, but could reach the upper teens for some. 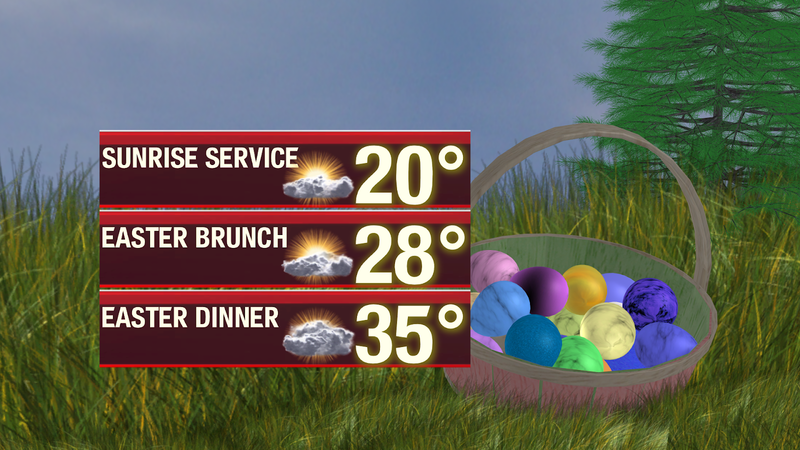 Wind chills Easter Sunday morning will be cold and in the low teens, to right around 10 degrees. High temperatures Easter will rise only to 39-40 degrees. 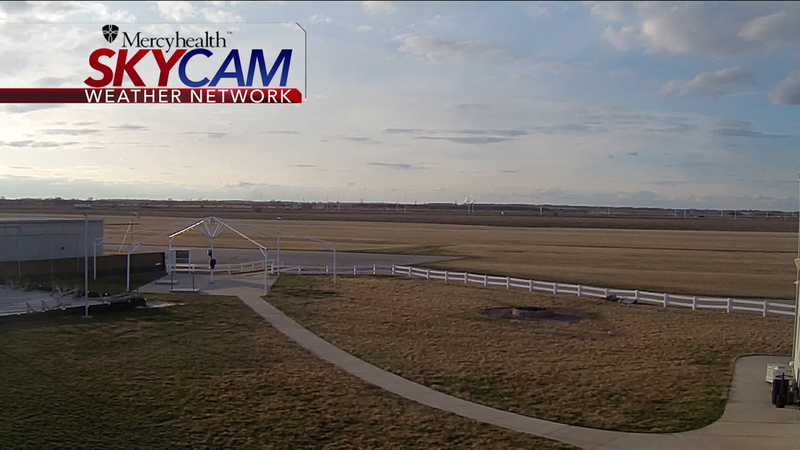 We had some clouds build up early this evening due to a mid-level trough moving through the area. There were a few small spots of rain, but now that is all out of the area, and because of that we've got this nice view. Skies will continue clearing heading through the evening, but we'll cool down quickly because of it, hitting the mid 30's by 9pm. 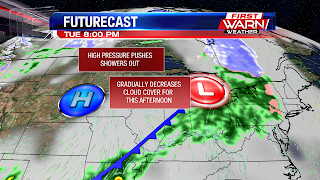 A low pressure system will begin moving into the Stateline during the overnight, gradually building up cloud cover after midnight. A few isolated showers will be possible out in Jo Daviess, Carroll, and Whiteside counties between 1-2am, otherwise the Stateline will see clouds build up. 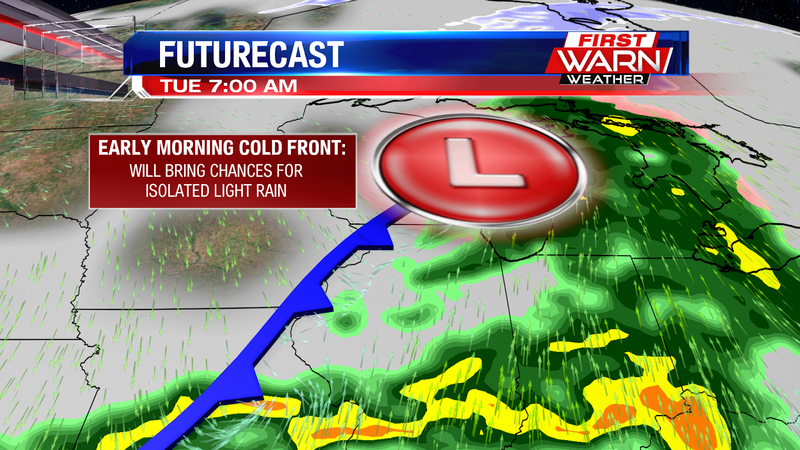 After 4am is when that low pressure system will bring a cold front into the area, allowing for scattered showers. A brief wintry mix will be possible around 5am as temperatures will still be in the mid 30's, but otherwise we'll just get rain from this system. 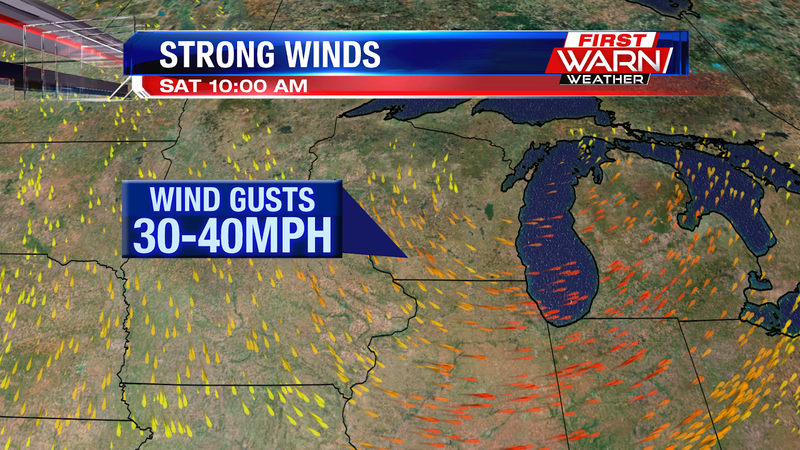 Along with that, winds will pick up quite a bit Saturday morning, with wind gusts peaking between 35 to 40 mph. The strong winds and rain showers will drop visibilities pretty low in a few spots tomorrow morning, so do be cautious if you're going to be on the roads Saturday morning. The rain will become more isolated by 10am, clearing out of the area by noon. We'll be mostly sunny during the afternoon, but sadly it will stay pretty windy. 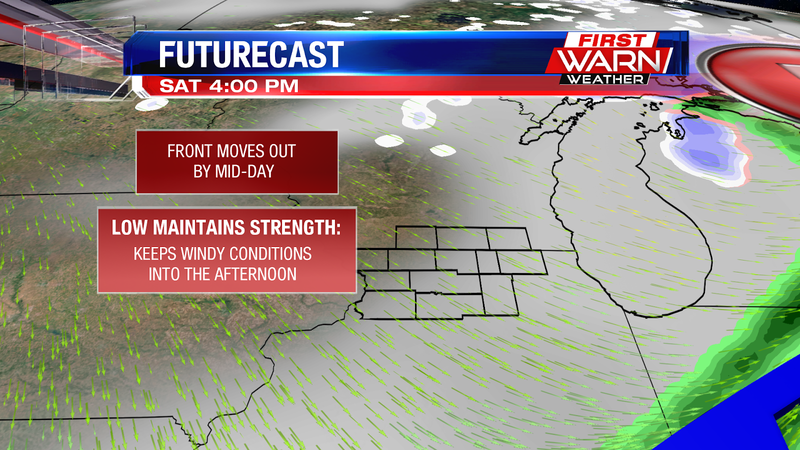 Highs will reach the upper 40's during the afternoon, with the winds dying down during the evening. 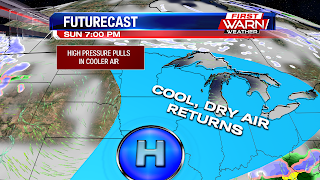 As we head into Easter, a high pressure system will track down from the north, bringing cool and dry air with it. This will drop our temperatures into the low 40's for Easter, but we'll still get plenty of sunshine, which will make things more manageable. Afterwards, we'll have another low move in on Monday, bringing us showers Monday night, followed by a chance for a wintry mix on Tuesday on the backside of that low. We dry up briefly on Wednesday, with a chance for another wintry mix on Thursday. 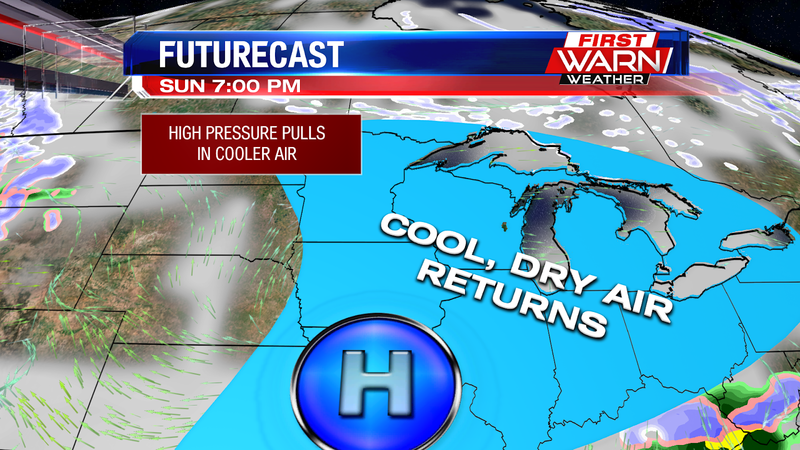 Temperatures will be on the cooler side next week, as our highs are expected to stay in the 40's. 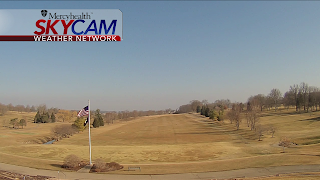 Temperatures this past week have been rather seasonable with highs warming into the low 50's. 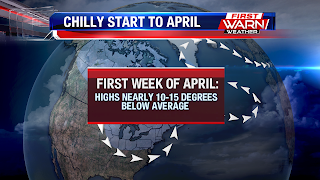 But as we turn the calendar page into the month of April, it looks like the overall pattern will transition to more of a cooler pattern for the first week or two of the month. Strong jet stream winds will move in from the Northwest and line up right over southern Wisconsin and northern Illinois through the weekend. 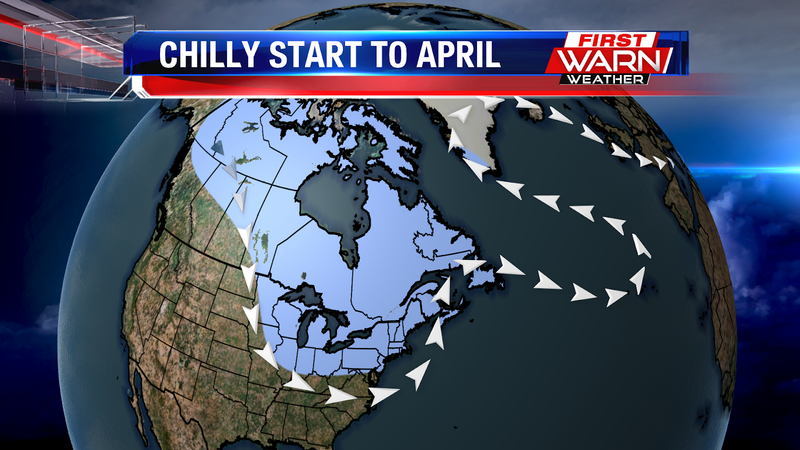 A blocking high pressure system over Greenland will help push the jet stream southward, pulling down a cooler air mass from Canada beginning Easter Sunday. 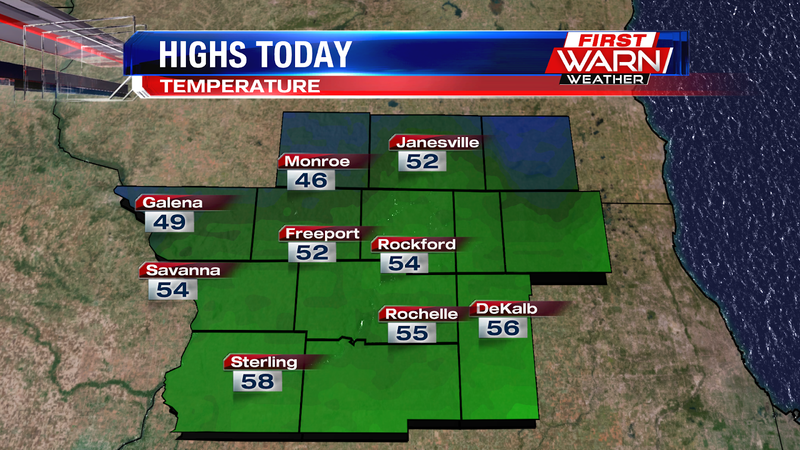 Temperatures Sunday will only warm to 40 degrees in Rockford with a few locations remaining in the upper 30's. 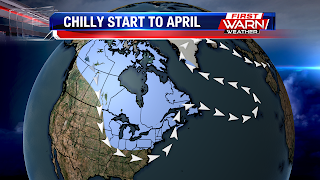 With the jet stream remaining close by next week a series of low pressure systems will move in from the west and northwest keeping temperatures in the mid and upper 40's. Average high temperatures should be in the mid 50's but actual highs will run nearly ten to fifteen degrees below average. 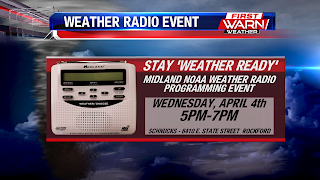 The First Warn Weather team is happy to announce that we have once again partnered with Midland NOAA Weather Radio to help keep you and your family safe this severe weather season. Each Wednesday for the next 10 weeks we'll be out at the local Schnucks and Walgreens stores throughout northern Illinois helping program your weather radio. And if you don't have one, it's the perfect time to purchase one. 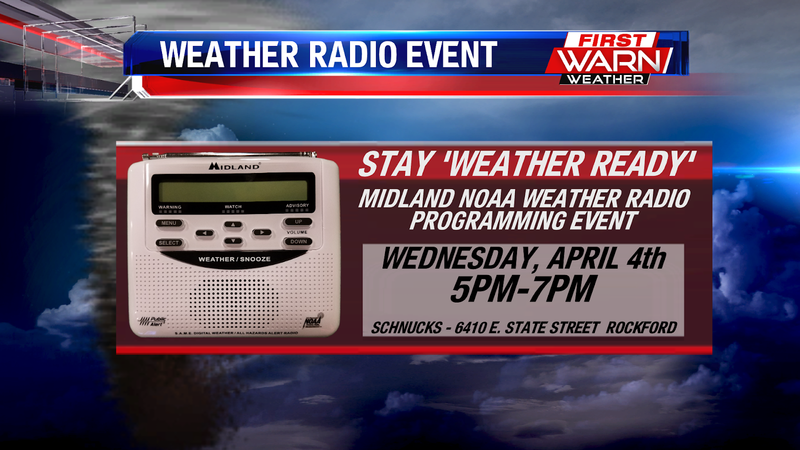 Next Wednesday, April 4th the First Warn Weather team will be at the Schnucks on East State Street in Rockford from 5pm to 7pm. During this time you can stop by the store to purchase a Midland NOAA Weather Radio, or bring in your own radio if it's not working properly. A weather radio is the perfect way to stay informed when severe weather occurs. It's like your 'smoke detector' for severe weather and alerts you the minute a watch or warning is issued. While many have alerts on their cell phones, a weather radio will wake you up in the middle of the night when severe weather occurs, allowing you to get to shelter. 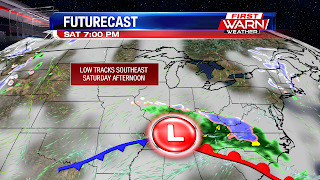 An incoming low pressure system for the start of the weekend will track northwest of northern Illinois late Friday night and early Saturday morning. Winds ahead of the low will increase from the south helping to not only pull in a little more moisture, but also a warmer air mass. 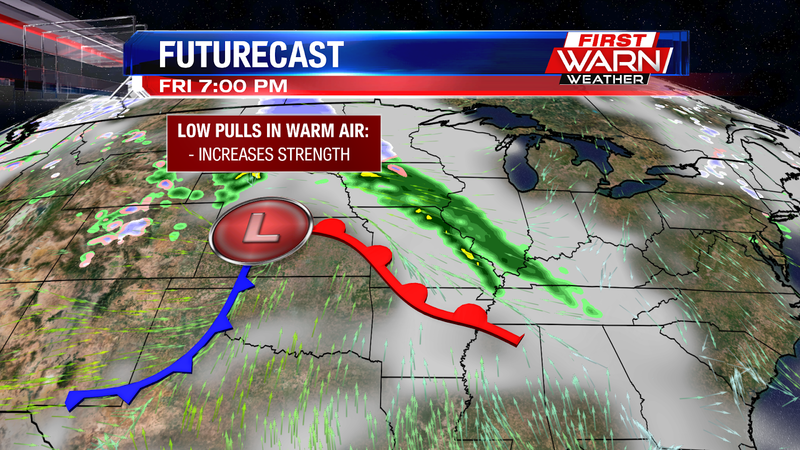 This will keep temperatures in the mid 30's Friday night. 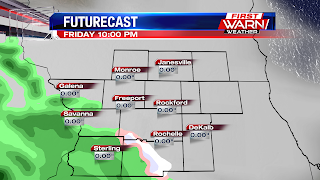 Rain showers are expected to develop overnight Friday in northern Illinois, but could mix with a few snow showers north of the state line by Saturday morning. Low pressure will quickly move from the northern Plains into Wisconsin by Saturday, before heading into the eastern Great Lakes by Saturday night. Winds ahead of the low Friday night will increase, gusting close to 40 mph through Saturday morning. Following the passage of the low Saturday afternoon winds will shift around to the northwest, helping to pull down a cooler air mass through Saturday evening. Most of the precipitation should be done by mid-day Saturday, but a brief period of a rain/snow mix or even a rain/graupel mix could occur by early afternoon. 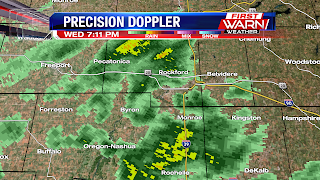 7:10pm Update: Rain showers will continue on and off through the rest of the evening. 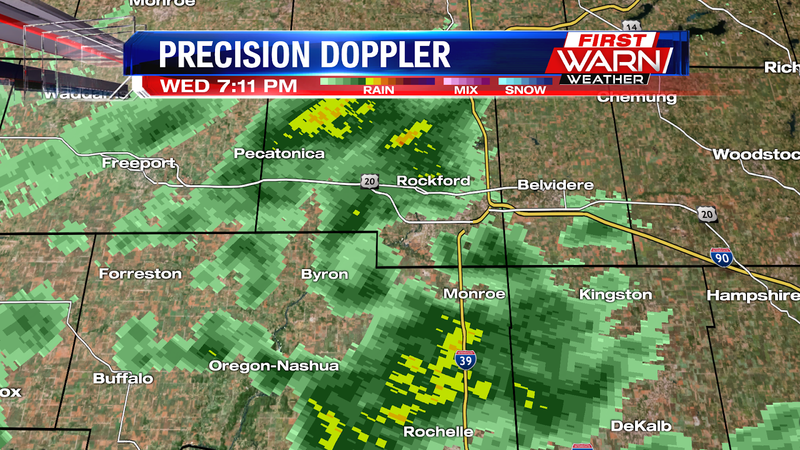 A little more heavy rain falling north of Rochelle and Hillcrest, Rockford and Pecatonica. 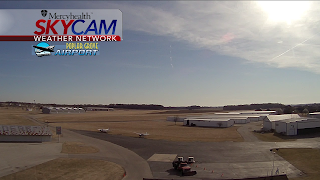 We didn't see quite as much sunshine as what we had hoped for Wednesday afternoon but temperatures still managed to reach the low to mid 50's. Winds were light and at times the clouds thin enough to still manage a little sun during the afternoon. 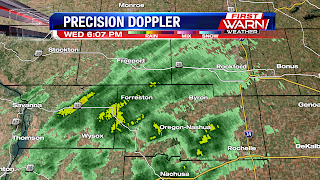 But as we get closer to sunset Wednesday evening, light rain has started to move in from the southwest impacting parts of Carroll, Ogle, Lee, Stephenson and Winnebago counties. The rain will be light this evening, becoming more widespread during the overnight as a cold front moves in from the northwest and an area of low pressure moves up from the southwest. 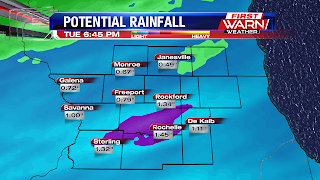 The heaviest rainfall will remain south of the Stateline through Thursday with most locally picking up less than a tenth of an inch. A beautiful view out in Freeport this morning, this giving us a preview of what today is going to be like......sunny and warm! 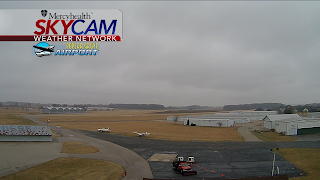 The fog has been clearing up across the Stateline, and will be gone by 10am, after which the sunshine will take over for the rest of the afternoon. This will warm up our temperatures quickly heading through the day, hitting 60° during the afternoon. 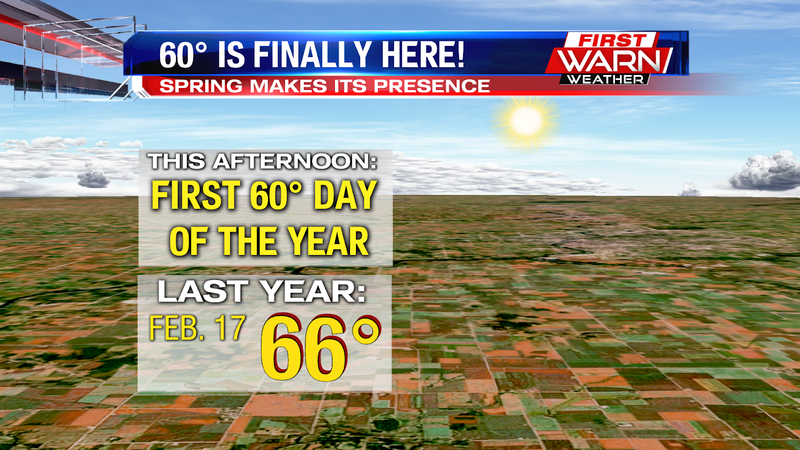 This will not only be our first 60° of spring, but the first 60° day of the year as well! Last year we hit the 60's in February after a low pressure system drew in lots of warm air. 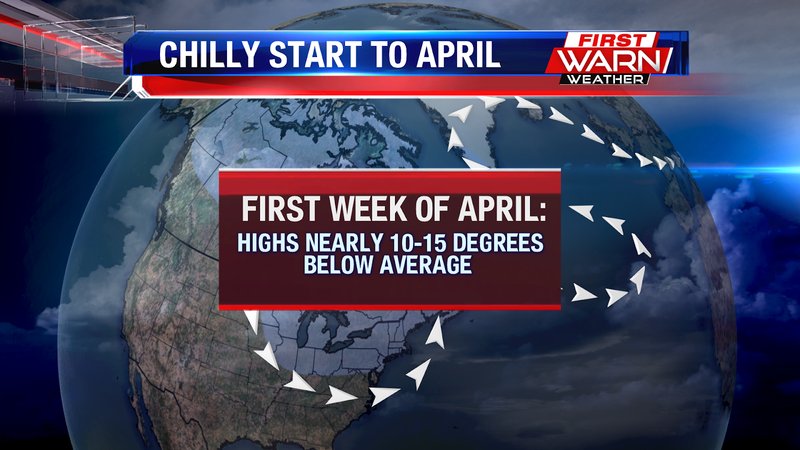 This year, it's taken much longer, and we're already at the end of March heading into April, so we're overdue for that 60° weather. Two low pressure systems, one to the northwest and one to the southeast, are the reasons that we've got this dry air boundary over the Midwest. This is what will cause all the sunshine this afternoon, and of course will also bring us to our 60°. Once we get into this evening we'll start to see clouds build up due to an approaching low from the southwest. This will bring a warm front into the Midwest by Thursday morning, bringing us slight chances for isolated rain. Otherwise, we stay for Thursday, partly cloudy with temperatures in the low 50's during the afternoon. The system following will form out in the Rockies early Friday morning, tracking to our area by the late night hours. This will bring chances for light snow during the overnight Friday, and because this system will be lingering due to a pattern change in our jetstream, we'll see a wintry mix for Saturday. The good news is, that low will track out of our area for Easter, so we'll be dry. 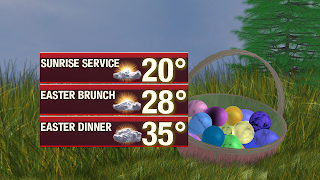 Easter's expected to be on the cooler side in the low 40's, but we'll get plenty of sunshine that day, which will make the cooler temperatures much more manageable. The rain that fell late Monday night and early Tuesday morning wasn't much, but was much needed. 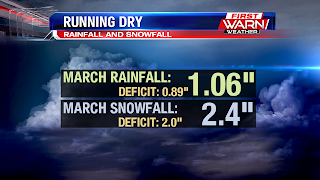 Anywhere from a tenth of an inch, up to three tenths of an inch of rain came down putting a small dent in the precipitation deficit for the month of March. Rainfall so far this month has added up to over an inch, but is still close to an inch below where we need to be. Snowfall is also running below average by nearly two inches. There are a few showers in the forecast for Thursday, and then again Friday night into Saturday but neither of those days look to help bring the deficit back up. Looks like we'll end the month of March a little dry. 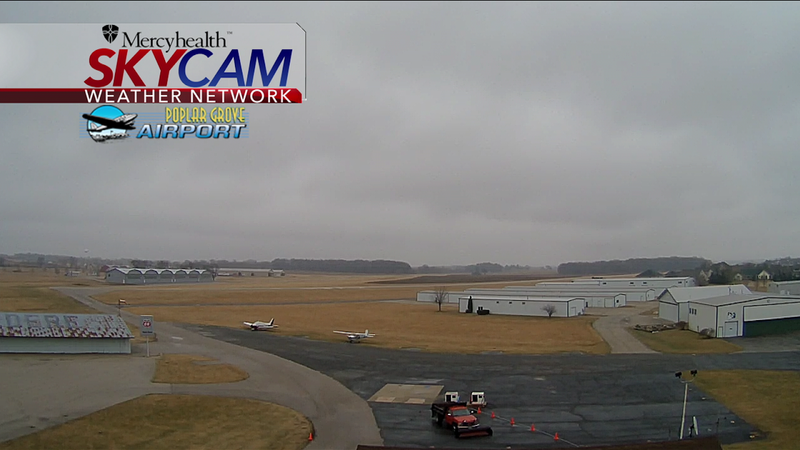 Not exactly the nicest view on our Mercyhealth Skycam, but at least the showers are now out of the area. 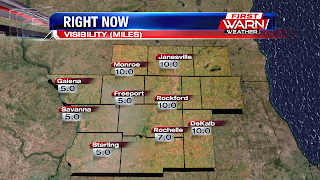 There are still some foggy spots across the Stateline, but these will clear up by 10am. We keep cloudy skies heading through the afternoon, but luckily we'll still see some warm temperatures around 53° this afternoon. This high pressure system will move in as we progress through the afternoon. It'll gradually decrease our cloud cover, bringing us our best chances for sunshine once we get into the evening before sundown. The high will move in late evening, clearing our skies for the night, which will cool us off pretty quickly heading into the overnight. Lows will be around 33°. That high pressure system will be a bigger benefit for us tomorrow, as it'll create this slot of dry air between the low to the east and a low to the northwest. This dry slot will allow for beatuiful, blue skies on Wednesday, and all the sunshine will warm us to 60°, our first 60° day of Spring!! Definitely plan some outdoor activities, because Wednesday's going to be great. 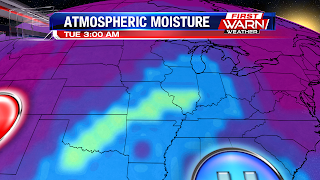 After that high dies down late Wednesday night, we'll have another low pressure system form in the southern plains and track towards our area. This will bring us our next round of rain, which will be Thursday afternoon. We're not expecting any heavy rain showers, just some light rain. As for Easter Weekend, we'll have cool, dry air move in from the north, causing temperatures to cool to the mid 40's for the weekend. Even though it'll be a little cooler, we'll get lots of sunshine for all of Easter Weekend, which will allow great conditions for Easter egg hunting and all the other outdoor activities. 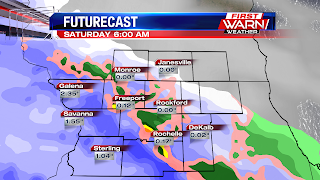 Warmer air and incoming rain showers will work to melt away quite a bit of the snow that came down over Iowa, west-central and central Illinois Saturday afternoon. 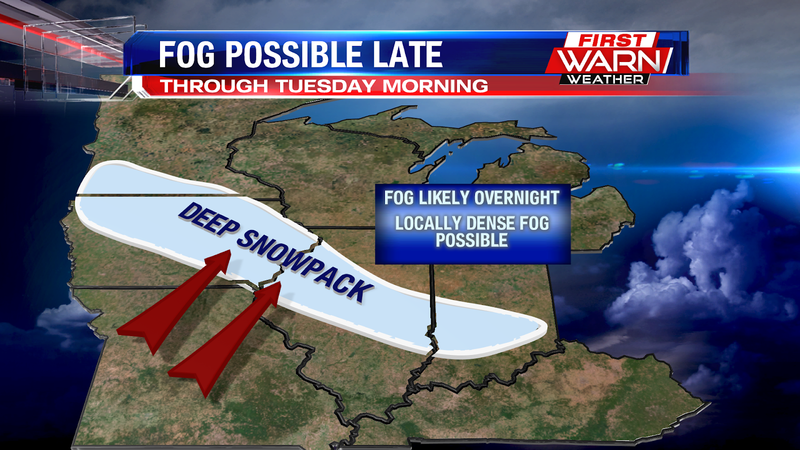 All the added moisture in the atmosphere will most likely cause fog to develop by early Tuesday morning. 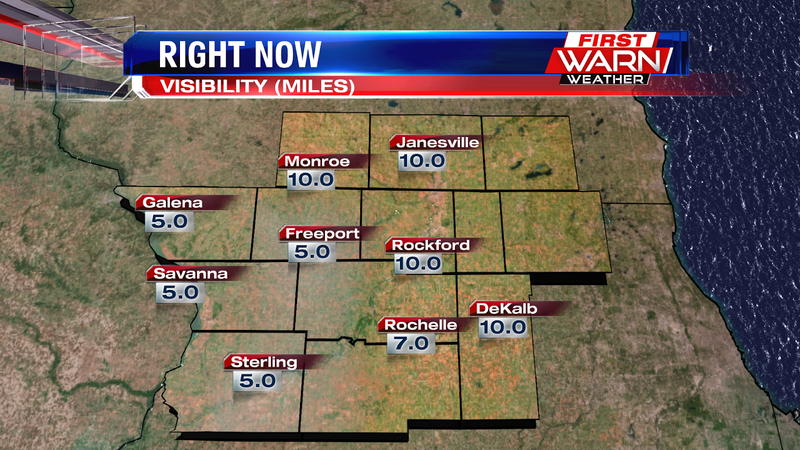 Visibility has fallen over northwest Illinois where the rain is currently falling. But as some of the rain moves out, fog will begin to set in, and has already developed over central Iowa. Locally dense fog is possible for some Tuesday morning. 8:30pm Update: Heavier rainfall has developed and extends from Freeport, southwest towards Savanna. Some of the heavier rain showers could cause water to briefly pond on the roadways. 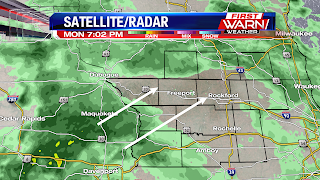 Light showers developed late Monday afternoon north of Highway 20, but more widespread rain is developing over eastern Iowa and is expected to move into northern Illinois between 7pm and 8pm. 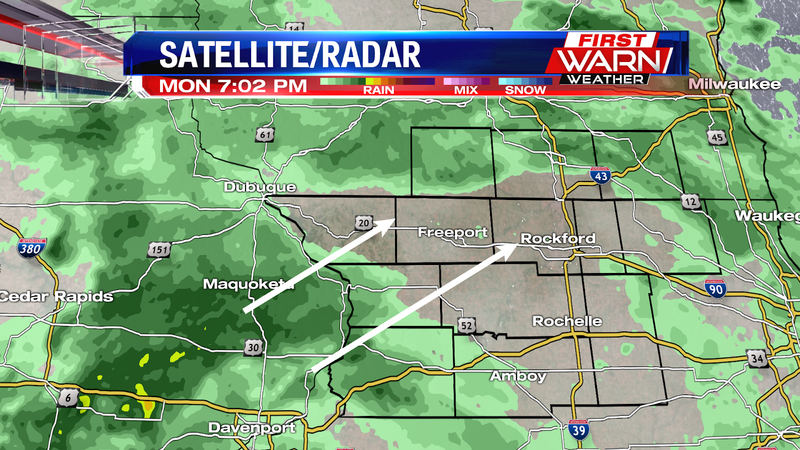 Rain showers will be light, but periods of moderate rain during the overnight can be expected, with even a few rumbles of thunder south of Rockford. 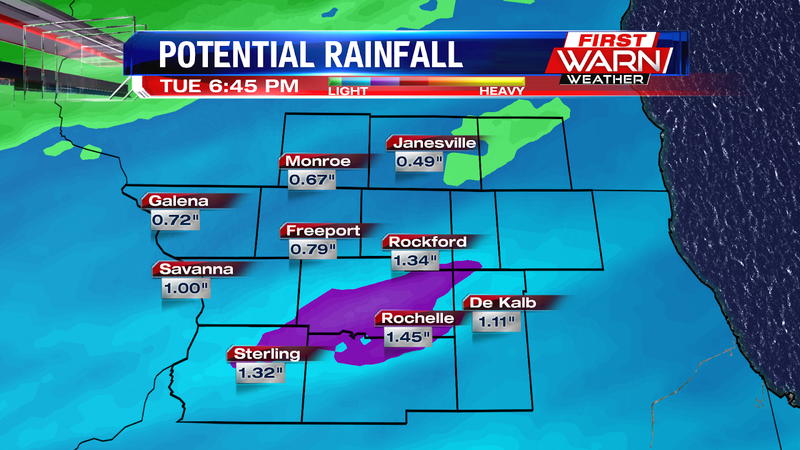 Rainfall totals will add up between half and three quarters of an inch by mid-morning Tuesday. We got to wake up to a beautiful sunrise this morning, a great way to start off the work week. That sunshine helped warm up the cooler temperatures from this morning pretty quickly, and will continue to do so as we head towards mid day. 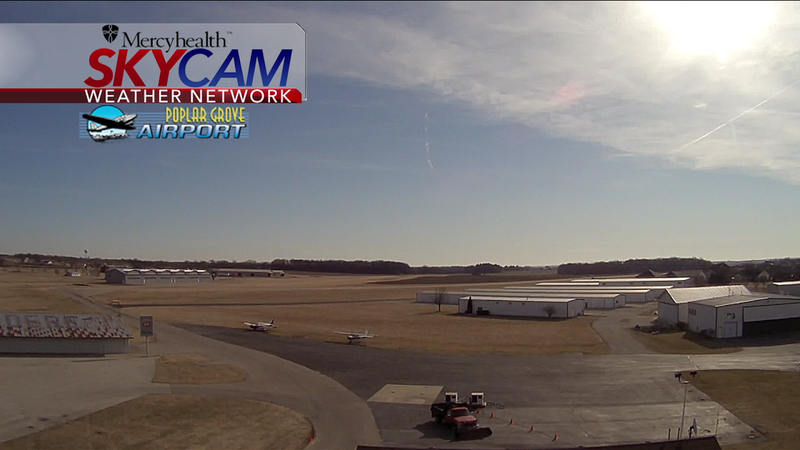 More clouds will move in heading into the afternoon, but we'll still manage to hit the low 50's this afternoon! You'll want to enjoy the morning sunshine while you can because the clouds moving in for the afternoon are part of a low pressure system out to the west, which will bring us chances for rainfall later today. 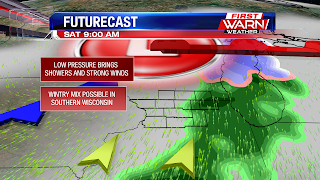 Once we get into the afternoon, we'll have chances for isolated, light rain out in Jo Daviess, Carroll, and Whiteside counties after 1pm, but otherwise the Stateline stays dry heading into the afternoon. However, after 4pm, scattered showers will begin moving into the Stateline as that low pressure system closes in on our area. 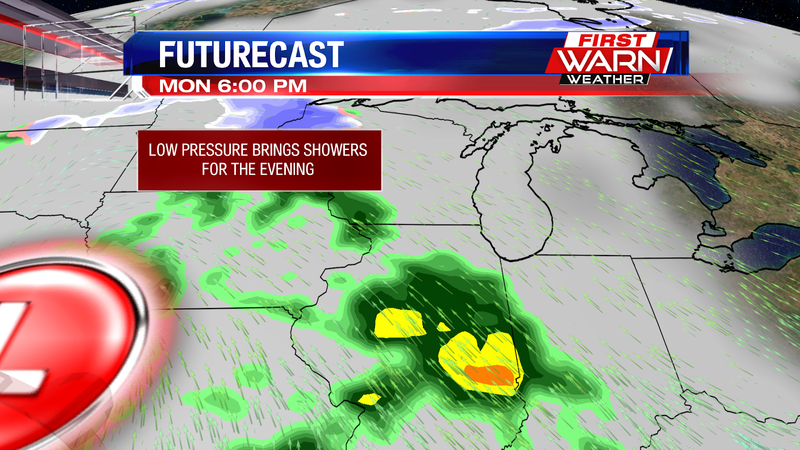 Because of that low pressure center moving over the Stateline, some of these showers will be producing heavy rainfall. The showers will last into the overnight, dying down as we head into early Tuesday morning. 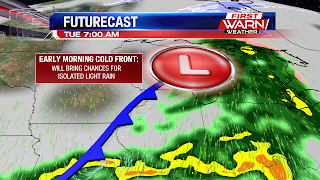 Once we get to around 7am Tuesday morning, that low pressure system will bring a cold front through our area, but any rain we do see will end up being isolated, and on the lighter side. The front will move out around 10am, after which we stay dry while maintaining cloudy skies. 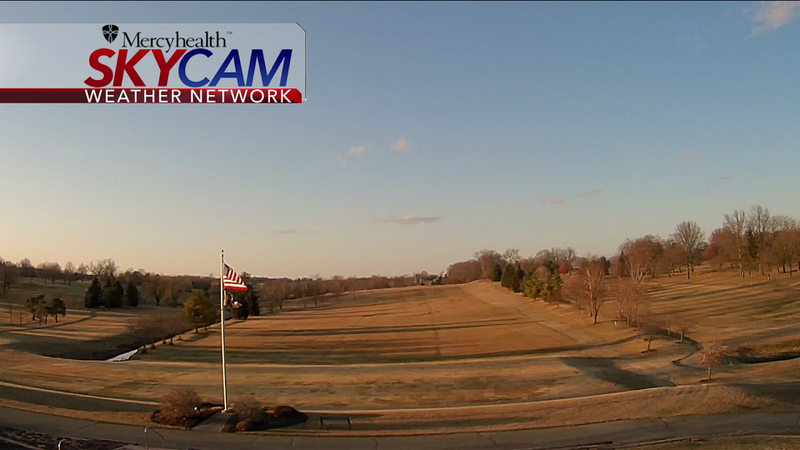 Despite the clouds, we'll still hit the mid 50's Tuesday afternoon. However, once we get into Tuesday evening, this dry air inflow from the west will help to clear our skies, giving us a little sunshine before the sun goes down. 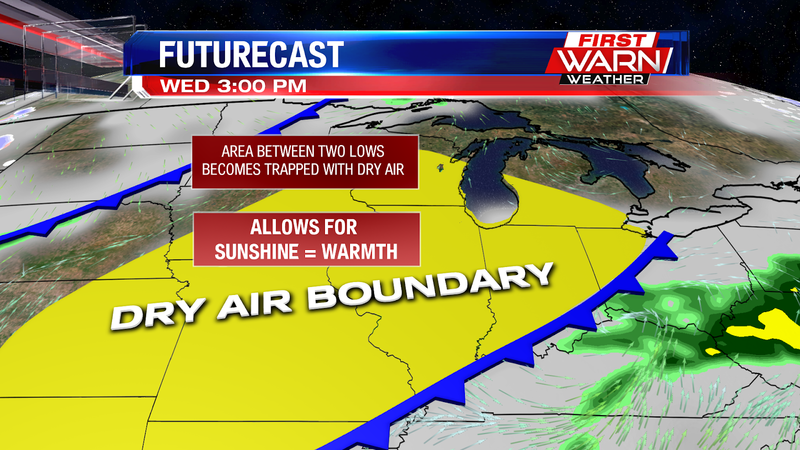 The main benefit of this dry air inflow will come on Wednesday, as it'll keep the skies clear and allow for lots of sunshine, bringing us near 60° during the afternoon, so you'll definitely want to plan some outdoor for Wednesday! Afterwards we'll have a slight chance for rain heading into Thursday, but otherwise we stay dry for the rest of the work week, with chances for a wintry mix heading into the weekend. Despite the rain chances, temperatures will stay in the 50's for most of the work week. Enjoy the warmer weather! A pattern change for the last week of March will bring an increase in the potential for rainfall Monday and Tuesday, and an overall active start to the month of April. 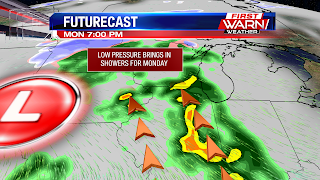 Low pressure will move through the Plains and into the Great Lakes by Monday night. 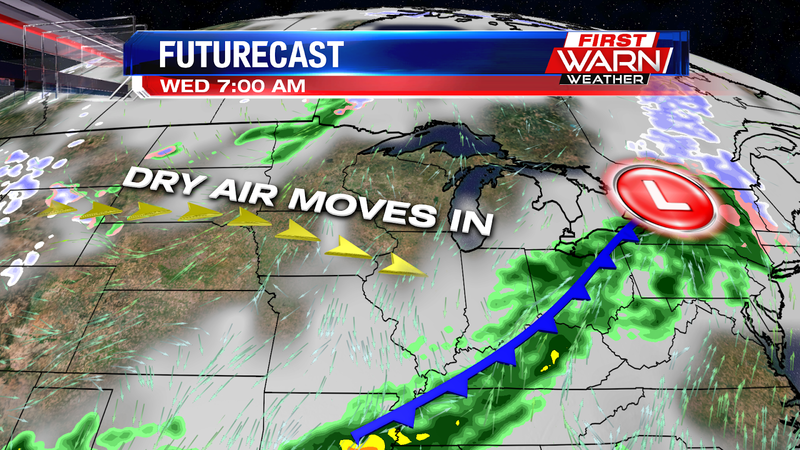 Jet stream winds will shift around to the southwest working to pull in more moisture from the Gulf of Mexico. Mainly clear skies will start the day Monday, but clouds will be quick to return by the afternoon. As a warm front lifts closer to Iowa and Illinois during the day Monday, rain showers will begin to develop after 3pm in the southwest, lifting northeast between 6pm and 7pm. Rain showers could be heavy at times for some Monday night, with even a few claps of thunder possible. However the highest chance for any thunder will likely remain over southern Iowa and central Illinois. Rainfall totals between Monday evening and Tuesday will range between half an inch to three quarters of an inch. Totals nearing one inch will most likely be achieved south of the immediate Stateline, closer tied to higher moisture in the atmosphere. Temperatures Monday will warm into the upper 40's, to low 50's with overnight lows Monday night staying very mild in the mid and upper 40's. 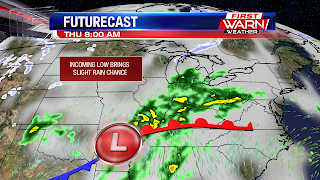 By Tuesday a cold front moves through shifting the heaviest rainfall to the east. Temperatures will warm into the mid 50's before cooling into the 30's Tuesday night. This was a beautiful site to see on our radar. The heavy snow finally moving out earlier this afternoon, and it continued to die down as we moved through the evening. 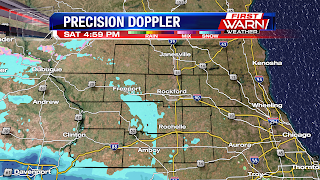 There's still a few spots of lingering flurries and light snow down in Ogle County, but this will be gone by 7pm, after which we stay dry for the rest of the weekend! The western half of the Stateline took quite the punch from Old Man Winter, with some areas in Whiteside county seeing upwards of 8-8.5 inches. The range of accumulation for the western half as a whole was anywhere between 3-7 inches of snowfall. As for the east side, there wasn't any?! The east side of the Stateline's accumulation was expected to be smaller, but something took place overnight that doesn't happen a whole lot with meteorology. A high pressure to the northeast strengthened quite a bit during the overnight. 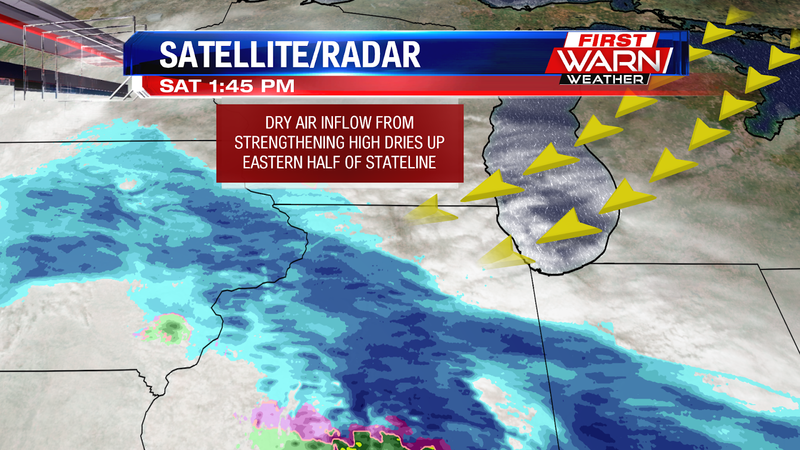 This caused it to push heavy amounts of dry air into the Stateline area. 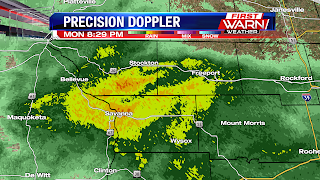 This affected the east side, which is why the snow couldn't make it over as it kept evaporating every time it got close to the eastern half of the Stateline. 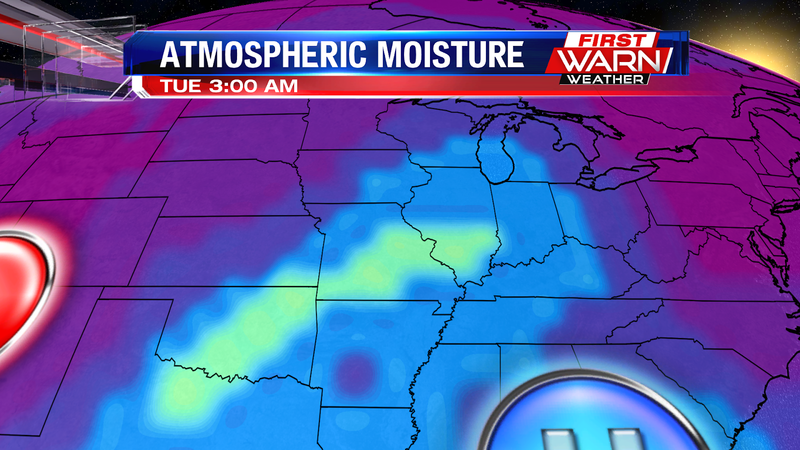 Along with that, the low pressure that brought us the snow was pulling in lots of moisture from the southwest. This created a tight wind gradient between the easterly winds from the high, and the southerly winds from the low. 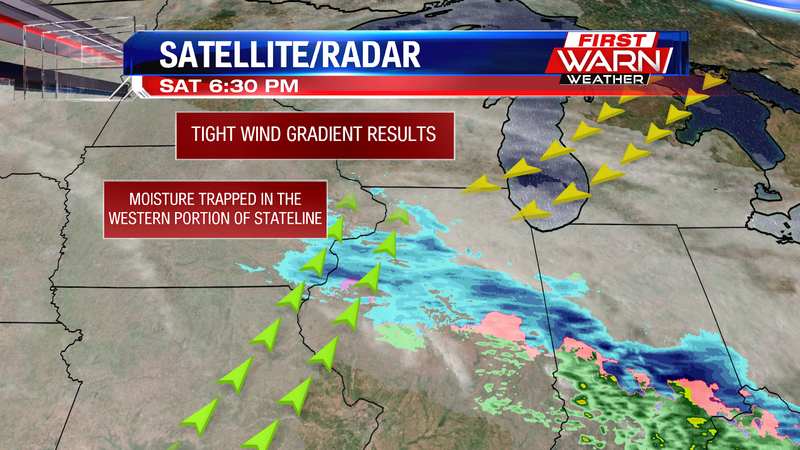 This wind gradient trapped the moisture to the western half of the Stateline, keeping is from moving further eastward. Now that the snow is gone, all we've got to look forward to is warmer weather! We'll start to see those temperatures warm up as we head into next week. We'll see the mid 40's for Sunday, and get plenty of sunshine with it. 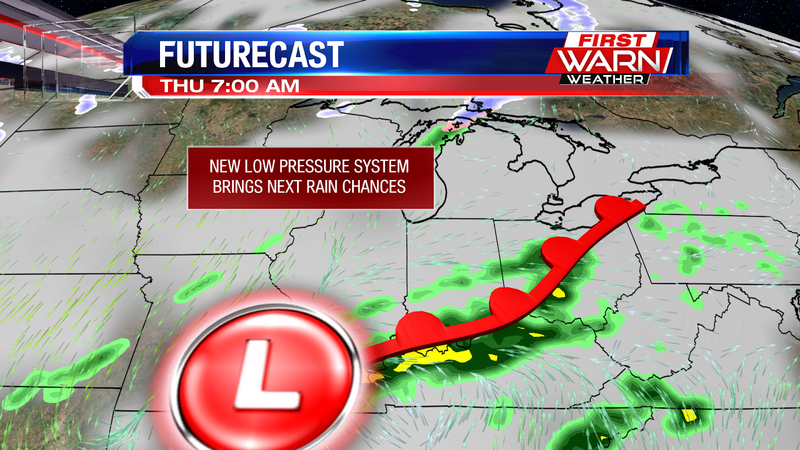 This low pressure system will move in for the start of the work week, bringing us into the 50's for the start of the work week, and near 60° on Tuesday. However, we are expecting some rain for Monday and Tuesday, but for Wednesday and Thursday we'll get lots of sunshine and keep the 50° weather! After a nice first week of Spring, Old Man Winter wants to have the final say, and he got it! 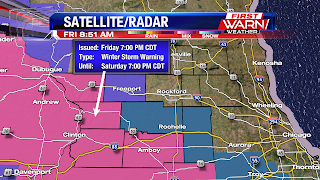 More snow is on its way to the Stateline, and many areas will be seeing some heavy bands of snowfall, which is why Winter Storm Warnings have been issued for Jo Daviess, Carroll, Whiteside, and Lee counties, with Winter Storm Watches in Stephenson, Ogle, and DeKalb counties. These will be in effect from 7pm tonight, to Saturday 7pm. 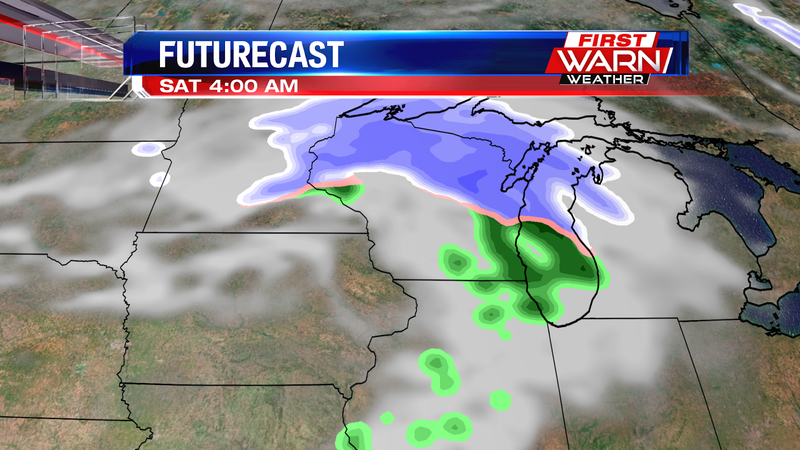 As we head into the late evening, we'll see some lighter snowfall out west around 10pm. A small amount of rain will be mixed in, but it'll mostly be snow. 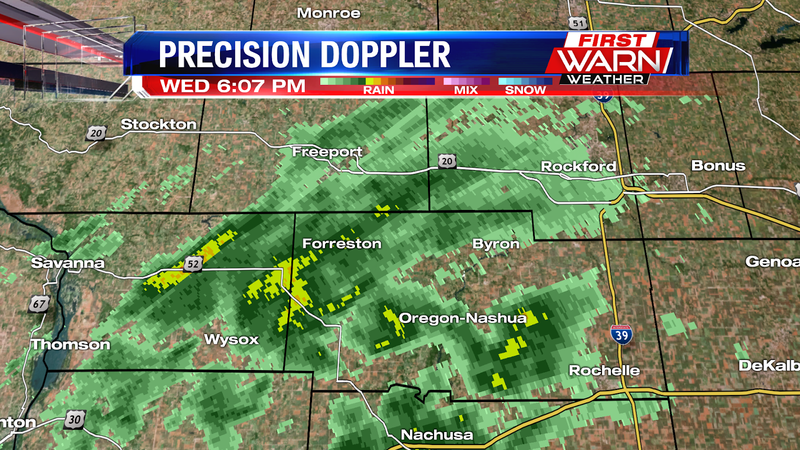 Everyone else will stay dry for the rest of the evening, before that band of precipitation moves further in overnight. Once we get into the overnight, we'll start to see some heavier snow move in from the west, and we can expect this around 1am. The heavier snow will stay over the western portion of our viewing area. The eastern half of the Stateline will see lighter snow, but that moves in later. 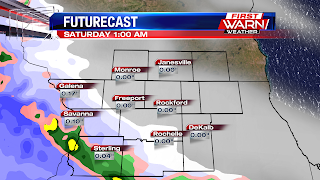 By 4am, we'll start to see some snow falling over the eastern portion of the Stateline. There will be a few spots of rain mixed in, but mostly this will be snow. Once that light snow moves out east, we hold on to this pattern through Saturday mid-day: heavier bands of snow out west, lighter snow out east. Once we head into the afternoon, we'll start to see the snow taper off, clearing out by 4pm. Snow Accumulations vary heavily, with the western portion seeing more due to the heavier snow bands. 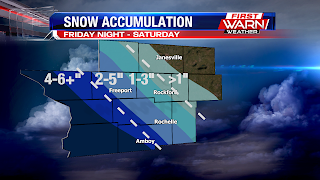 Out east, in Winnebago, Boone, McHenry, DeKalb, and the eastern portion of Ogle and Lee counties will be up to 2 inches of snow for the duration of the system. For Stephenson, western Ogle and Lee, Whiteside, and Carroll counties, these areas will see around 4 to 4.5 inches of snow, and will also deal with some heavy bands of snowfall. On the border between the Stateline and Iowa, these areas have chances for seeing up to 6 inches of snow since these areas will be closest to the heaviest snow band, which will be out in eastern Iowa; that area will see upwards of 8 inches. With these heavy snow bands moving over the western portion of the viewing area, visibility will be reduced quickly and roads will get slick fast, allowing for poor road conditions. 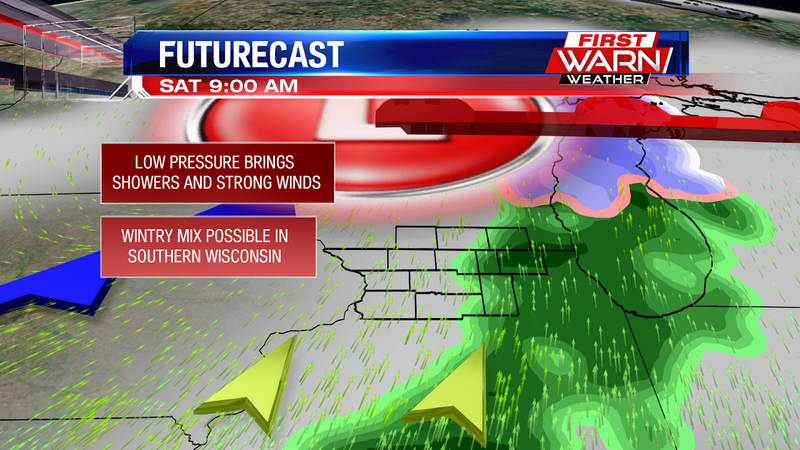 Along with that, strong winds will move in on Saturday, allowing for blowing snow to occur as well. Both of these factors will keep road conditions poor during the overnight, and through Saturday morning. If you have travel plans, you may want to hold off on them until Saturday night instead if you live in the counties that are expecting heavier snow. The good news is, our temperatures stay mostly warm this weekend, so that snow will melt quickly. The only time it'll freeze will be during the overnight Saturday night, as we'll dip into the mid 20's. 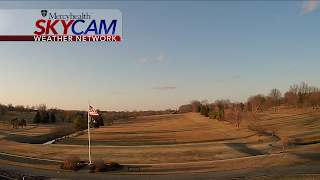 After the snow moves out, warmer weather returns to end the weekend and stays with us heading into the work week. We'll have a few rain chances at the start of the work week, with drier conditions towards the middle of next week. 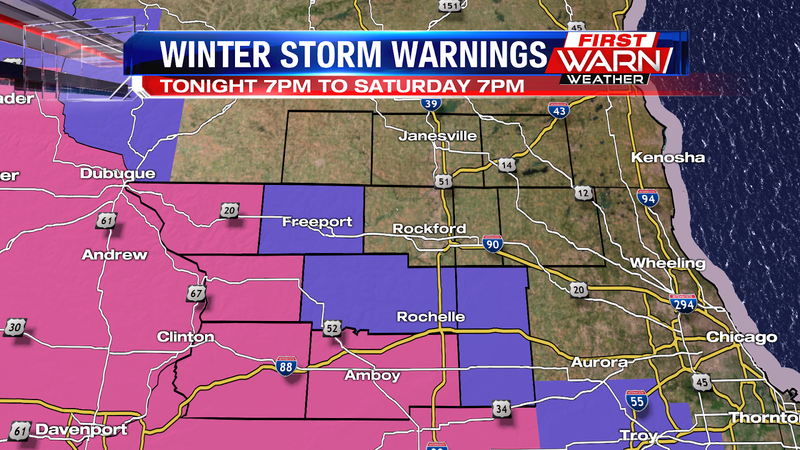 Winter Storm Watches have been upgraded to Winter Storm Warnings for many areas. 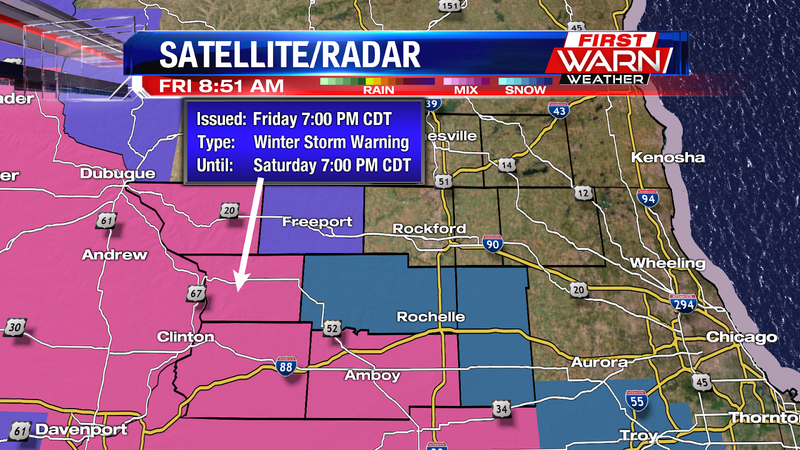 Jo Daviess, Carroll, Whiteside, and Lee counties are included in the Winter Storm Warning(pink). 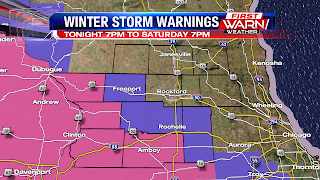 A Winter Weather Advisory has been issued for Stephenson County(purple). 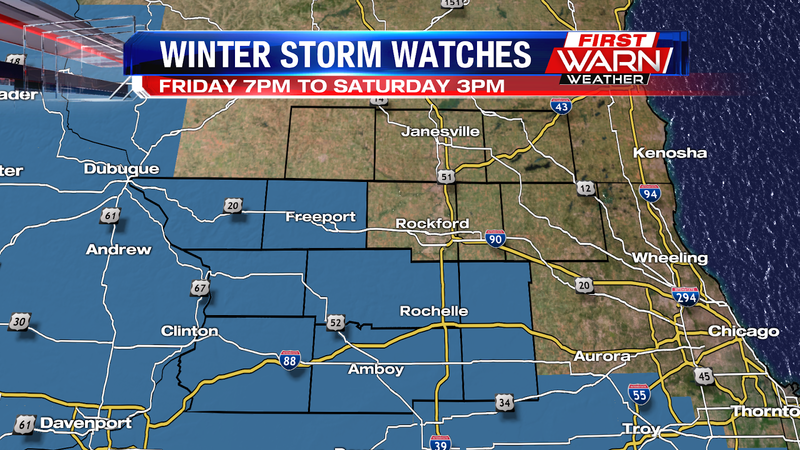 The Winter Storm Watch continues for Ogle and DeKalb counties(blue). 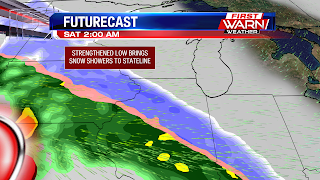 This system has high bust potential, with such a tight gradient of snow expected on the northern edge of the system. As the forecast stands now, the heaviest snow will fall near the Quad Cities and near the Mississippi River, and will drastically drop the farther east that you go. In Freeport I think a few inches are possible, while closer to Rockford around an inch is likely. However, the area in between the dashed lines is the area with the highest uncertainty in regards to snow totals. The farther east you go, expect little to no accumulation. Heaviest snow is possible near the Sterling area. It's possible for the system's track to change, and we will make sure to continue to update the forecast this evening. With the low pressure moving on shore earlier this morning, we will now have more information to feed into our models, which will help with a more accurate forecast. 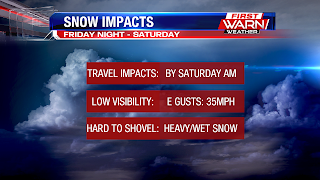 In the areas of heavier snow there are a few things you can expect. 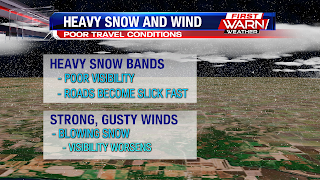 Heavy snow combined with a gusty easterly wind will reduce visibility through the morning and afternoon. The gusty winds will also allow the snow to stick to signs and even power lines, which could cause power issues. This type of snow is often referred to as 'heart attack snow' due to the heavy wet nature of it. If you get enough snow to shovel, you'll want to take a lot of breaks. The timing of the snow looks to arrive in the evening, around midnight, and will last mostly into tomorrow late morning. 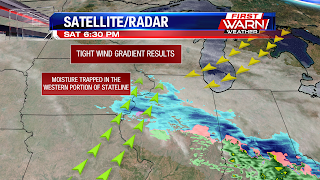 The far southwest areas of the Stateline will hold onto the threat for snow through the afternoon. Recent model runs have shifted this system to the southwest however, and that trend could continue with model runs this evening as well. 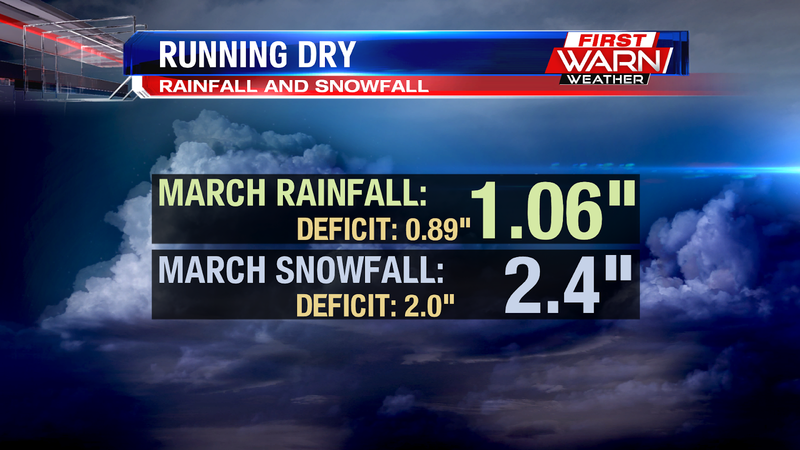 Recent runs have greatly reduced the amount of snow Rockford will see. We will continue to update you though as we get closer to the snow arrival. Stay tuned for more updates! 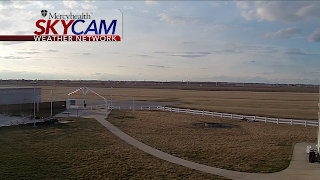 This snapshot of our Mercyhealth Skycam in Freeport gives you an idea of how great the weather was today, sunny and 50° with a light, spring breeze. The clear skies stay with us tonight, but this will cool us off quickly, into the low 20's during the overnight, so be ready to turn those heaters back on! The quick cooling will bring chances for patchy fog early tomorrow morning. Luckily, any fog that forms won't last long as temperatures will heat up pretty quickly under sunny skies tomorrow morning, before more clouds move in for the afternoon. These clouds will a result of a low pressure system moving in from the west, which will strengthen as it moves closer to our area. 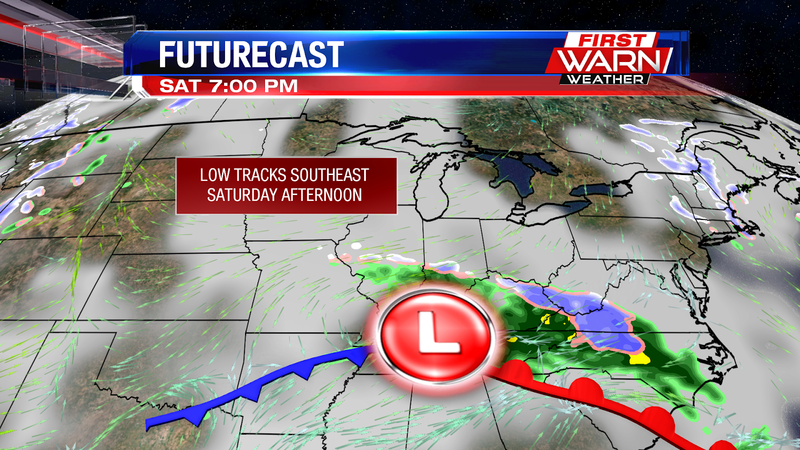 The low will build up a warm front, which will push that rain band into our area, only for us it's going to be snow. 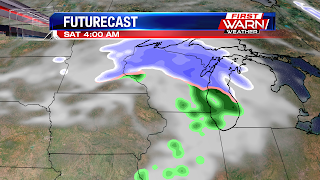 The snow showers will move in late Friday evening, and push further eastward through the Stateline as we head through the overnight Friday night. The snow will be heavy at times, and winds will be picking up as well, so be cautious on the roadways as visibilities will go down as the snow moves through. 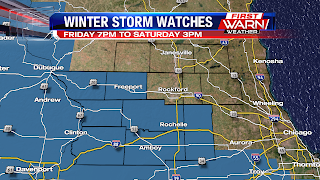 Because of this strong low pressure system, many of us have been put under a Winter Storm Watch from Friday 7pm to Saturday 3pm. 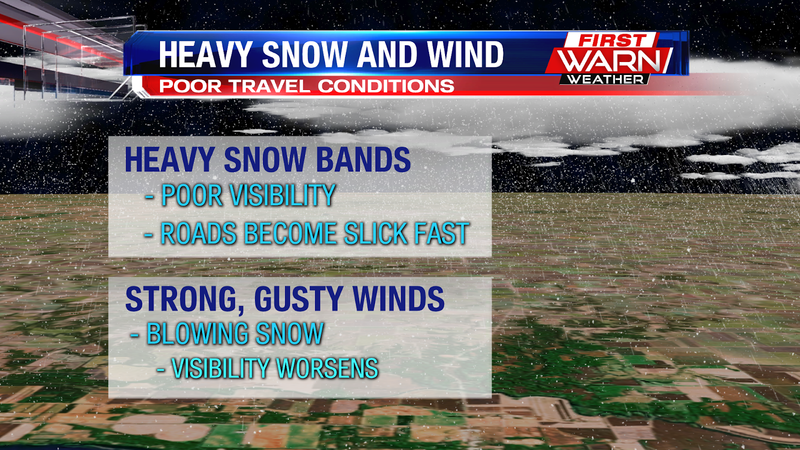 The main hazards will be heavy snow bands, strong winds, and low visibility. 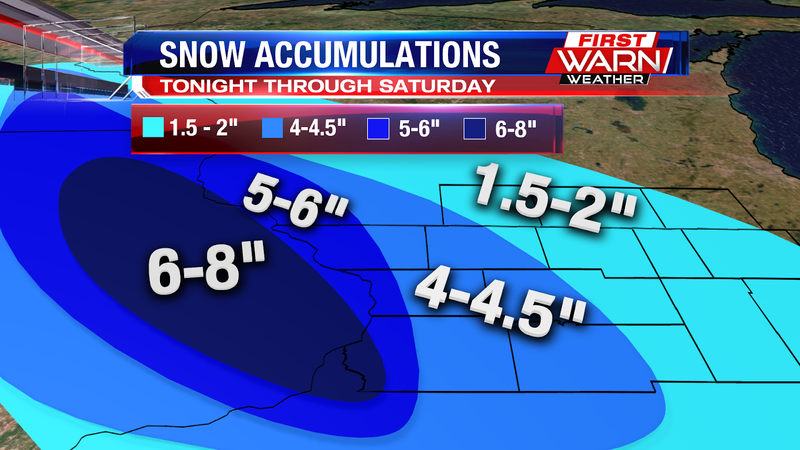 As far as accumulations are concerned, the bulk of the snow will fall out west. 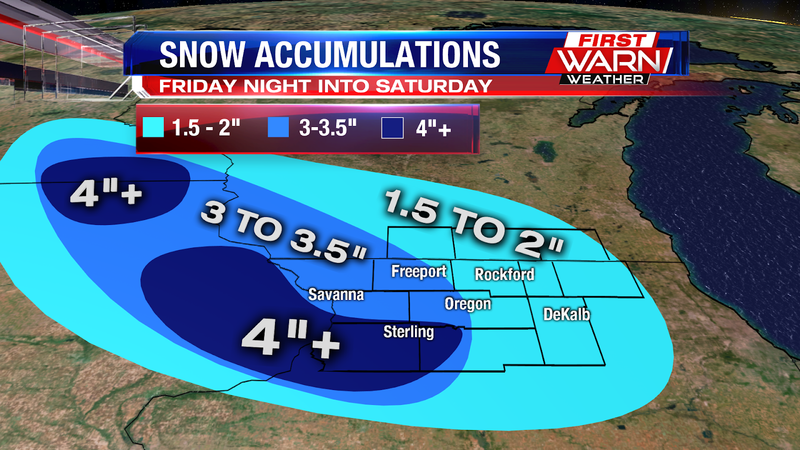 Whiteside county will be the only area that'll have chances for seeing 4"+ from this system. Otherwise the western portion of our viewing area will be anywhere from 3-3.5 inches. The cutoff between those areas and the lighter snow areas starts in Freeport and just west of Oregon. 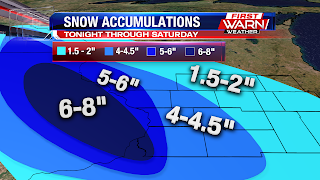 To the east of that cutoff, we can expect to see lighter snow totals, anywhere from 1.5-2 inches. After that low moves out mid-day Saturday, high pressure takes over to give us a nice end to the weekend, with sunshine and temperatures in the upper 40's for your Sunday.